We all know about Daniel Sprong, at this point. 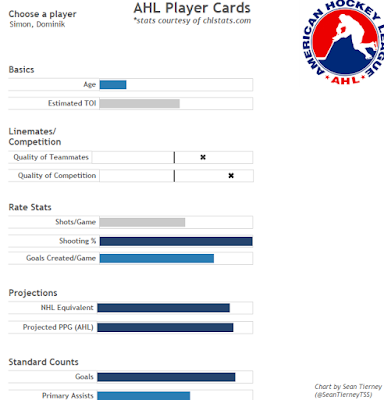 Drafted 46th overall in the 2015 NHL Entry Draft, and is currently in the NHL, right out of the draft. The last player to jump right into the NHL out of the 2nd round was Ryan O'Reilly. Most if not all hockey analysts have deemed Daniel Sprong a steal. But, was Pittsburgh Penguins general manager Jim Rutherford done there? It wouldn't seem so. Rutherford worked more of his magic when he drafted winger Dominik Simon in the 5th round, 137th overall. The Czech player was drafted at 21 years of age, and only a few analysts said during the draft that he would have a future in the NHL. Some may view him differently, now. In his first season in the AHL, Dominik Simon - a rookie(! ), mind you - has 11 goals and 25 points in 24 games. That's good enough for 4th in the entire league in terms of point scoring. Dominik Simon currently has 7 (count them, 7!) multi-point games, and has two two-goal games for the Baby Pens so far. It would seem Simon is making quite the first impression! Here's a look at some of his advanced stats. His shooting percentage is pretty darn high, as well as his NHLe. It supports the notion that he might fit into the Pittsburgh Penguins roster in the future, if an injury call-up is needed in the forward group. On December 10th, sports agent Allan Walsh shared that same sentiment. The Wilkes-Barre/Scranton Penguins will play the Lehigh Valley Phantoms on Wednesday, December 16th.